I wanted a light sauce for fresh ravioli stuffed with ricotta and spinach, so I checked the refrigerator for seasonal vegetables. This would also work with linguini or angel hair pasta. It’s an easy and quick recipe. Give it a a try! While the water for the ravioli boils, sauté the garlic, asparagus, and mushrooms in the oil until the asparagus is a bright green and mushrooms have softened. Sprinkle with salt and pepper. Add pesto and turn off heat. Meanwhile, boil ravioli according to package directions. Drain ravioli and spread on deep plate. Top with vegetables. Squeeze lemon over dish and sprinkle with lemon zest and cheese. Enjoy with crusty bread and olive oil in a dish. 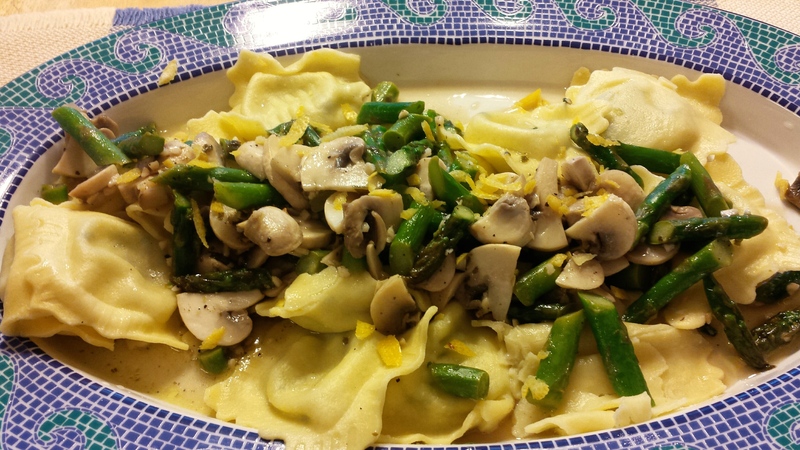 This entry was posted in Cooking, Food, Photos, Recipes and tagged Asparagus, Lemon, Mushroom, pasta recipes, Ravioli. Bookmark the permalink. Oh my. All my favorite things all together in one delicious dish!